Please let us know if you figure this out @Cyber Liberty. I'd love to know how you are working the code even if it isn't quotable. The problem is the BBC code "[ html]" doesn't work unless you're an Admin or Technical. It doesn't even work for a Mod account. There's a bug in the permissions that we can't get fixed for a few months (I located a discussion about it on the Forum Administrators forum). If I can track down the location of the bug I can do a work around, but I have to sift scores of permission settings. I had no idea when I posted my little experiment only I and a couple others could do it. @Right_in_Virginia handed me a technical poser, and I just can't resist those. It's a weakness. Just arrived in Calexico, California! Join me in California for a Roundtable on Immigration and Border Security! 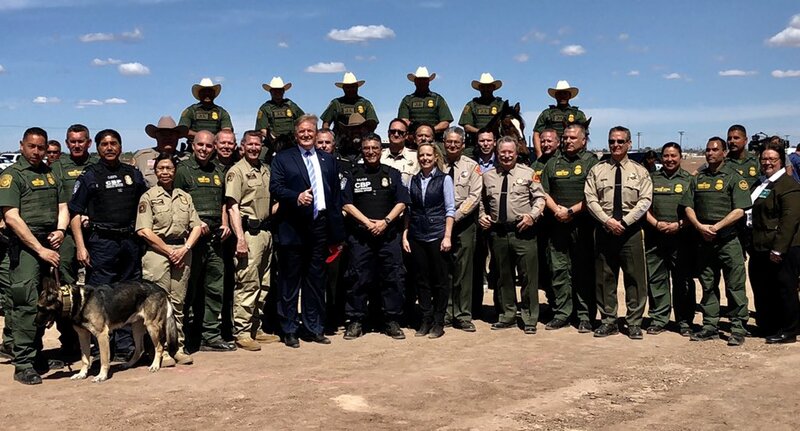 President @realDonaldTrump at the Southern Border with the great men and women who protect our country 24/7/365! THANK YOU!!! THANK YOU @DHSgov, @CBP, and @ICEgov! ....In the meantime, the Democrats in Congress must help the Republicans (we need their votes) to end the horrible, costly and foolish loopholes in our Immigration Laws. Once that happens, all will be smooth. We can NEVER allow Open Borders! With regard to Democrats and the media, I’m with the president. They are worthless, in fact they are worse than that. They are a danger to America and the world.
.@RealDonaldTrump is doing his job to SECURE OUR BORDER! @CBP is doing their job. It’s time for Congress to do its job and CLOSE THE LOOPHOLES in our immigration laws & end the CRISIS on our southern border! Hey Trump & Pence, why don't you guys get Kobach on the horn and consider what he is suggesting? Sounds more productive than whining about a Congress that you know isn't going to do a damn thing! “The reason the whole process seems so politicized is that Democrats made up this complete lie about Collusion ....and none of it happened.” Charles Hurt. The Russian Hoax never happened, it was a fraud on the American people! Rep. @Jim_Jordan on President Trump's tax returns: "There's no law that says they have to be public." Congratulations to the Baylor Lady Bears on their amazing win last night against Notre Dame to become the 2019 NCAA Women’s Basketball National Champions! Your Lady Bears are National Champions! A 9th Circuit Judge just ruled that Mexico is too dangerous for migrants. So unfair to the U.S. OUT OF CONTROL!